Head on over to THE CULBIN TRAIL for the most exciting news since Wyatt Earp showed Doc his pistol. A CIA secret weapon used for assassination shoots a small poison dart to cause a heart attack, as explained in Congressional testimony in the short video below. Barnes & Noble has been nearly overwhelmed by pre-orders for its upcoming Nook e-book reader , to the point where it has decided to not bring this device to its stores this week. 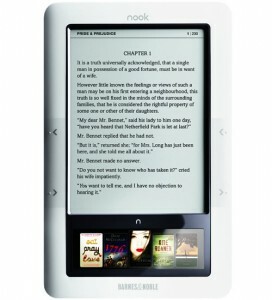 The Nook went on sale last month through B&N's website, and the company had planned to bring it to stores on Nov. 30. However, the company revealed today that this won't happen for another week. And there will only be a few units available in each store. B&N is going to put most of its efforts into being sure that those who have already pre-ordered this electronic book reader get it in time for the holidays. At this point, shipments are expected to start arriving on Dec. 11. Demand for the Nook has been so strong that Barnes & Noble has had to announce that only products ordered before Nov. 20 will arrive this year. The Nook webpage has a note warning customers that items ordered now won't ship until early January. Those who really want to get an e-book reader for someone on their gift list should note that there is no shortage of the Nook's rival, the Amazon.com Kindle 2. B&N's e-book reader will have much in common with Amazon's offering. It will differentiate itself by allowing users to lend books and connect to Wi-Fi networks. This device will have 6-inch, grayscale E-Ink screen for displaying the contents of books, newspapers, and magazines, and below that will be a smaller color touchscreen that will be used as a keyboard and to perform other actions. Users will be able to purchase and download e-books directly on the Nook, either over a Wi-Fi connection or over AT&T's 3G network. Those who want to access hotspots in B&N stores will be able to do so for free. 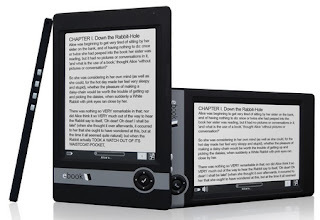 E-books will be in eReader, the open ePub standard, or Adobe Acrobat (PDF) format, and users will be able to move files onto this reader -- they don't have to come from B&N. This device will have 2 GB of internal storage -- that's room for about 1,500 books -- plus it will have a microSD card slot for additional capacity. The most unusual feature of the Nook will be the ability to "lend" books; users will be able to loan a text to one of their friends for up to 14 days for no charge. The receiver must have either a Nook or a compatible device -- iPhone, BlackBerry, Palm, PC, etc. 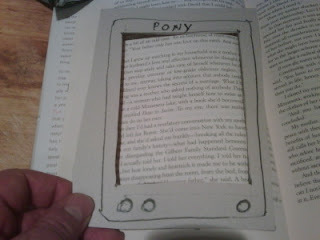 -- with the free B&N eReader software installed. This Christmas sees David Tennant handing over the keys to the TARDIS to newcomer , Matt Smith. Matt's got a tough act to follow and The Archive wishes him well. Tennant will always be a favourite with me - I like his manic interpretation of the Time Lord and of course I will always have fond memories of his tenure because I was in five episodes during Tennant's run as the Doctor. 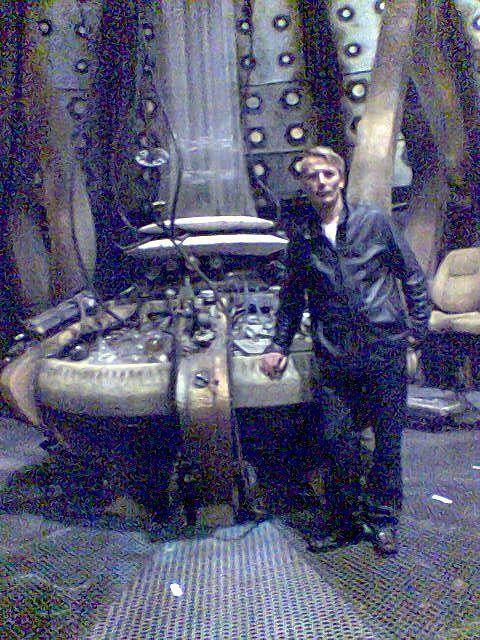 I can't remember the exact titles of all the episodes I was in - I was a blink and miss me in the Cybermen one - the episode set on the alternative Earth, same in last years Christmas Special and I was also in the Dalek/Cyberman war one. My biggest part was in the Daleks of Manhattan two parter in which I played a prisoner of the Daleks. It was a great show to work on - really good because I was a fan of the show as a kid, Jon Pertwee was my man, and my kids love the show today. I've also stood on the TAR DIS bridge.That was an awesome experience - OK it's just a set but you get a feeling of history when at the controls. 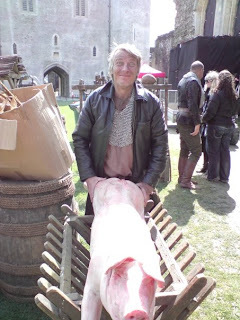 And although my parts were only small - just the one line across all the episodes - I was p roud to have been a part, no matter how small of Television history. Doctor Who can be naff and often was but when at it's best, it deserves the accolade of the best SF show ever. 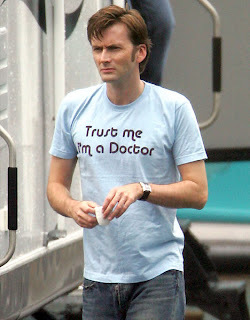 Whatever the future holds for the series, one thing is certain the Doctor will never be far from our screens. The Archive wishes both Tennant and Matt Smith all the best. I originally saw this STAR TREK re-boot in the cinema and my review is HERE and now that it's out on DVD was lookin g forward to re-watching it. Now that they hype has died down the film can be watched and enjoyed on its own merits. The pacing of the film is fearsome and no sooner are our eyes adjusted from one spectacle than we are blown away with another. Though it's not all whizz bang and the characters, the classic crew, are built up well even if the bulk of the time is given to the trinity of Kirk, Spock and McCoy. 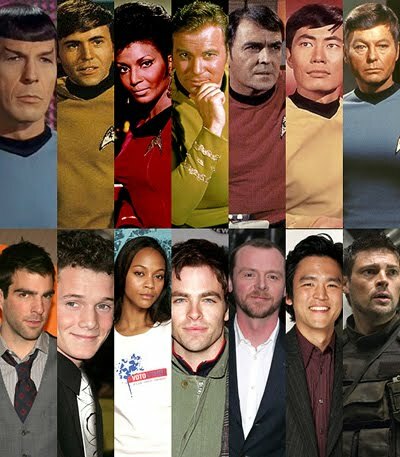 Now I'm no Trekkie but I do enjoy the original series as well as all its spin offs so I can't really comment on the original continuity that the film has trodden upon and ignored. But I was watching an episode of the original series, Shore leave and there's a character Finnegan and Kirk mentions that he was his rival at the academy but the new film ignore this. Though I'm not sure if the alternative universe thread in the movie explains this or not - my head hurts when I try to think about it. As a reinvention of the original series the movie works well and the characters really felt like Kirk and crew - McCoy especially, I thought, was spot on. The DVD comes as a two disc package and there are some great deleted scenes amongst the extras. 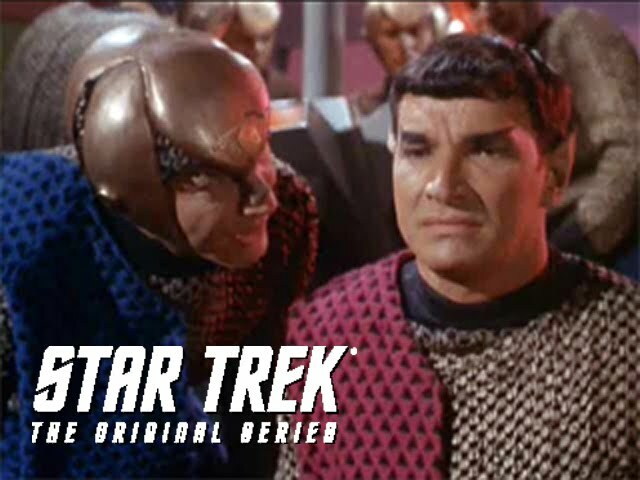 Among the don’t-miss extras are several deleted scenes: the birth of Spock, an expanded passage concerning Kirk’s dalliance with a green girl (he’s only using her to sabotage the computer against which he is pitted in a training exercise) and a long sequence in which the villain Nero (Eric Bana) and his crew are captured by the Klingons and sent to a hellish prison planet from which they eventually escape. 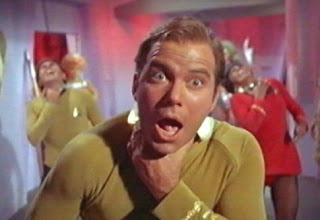 Willam Shatner was choked at not being able to make a cameo in the film, though there's no logical expla nation given the alternative timeline that would make it impossible for him to do so. But it was nice too see Nimoy here - perhaps next time the Shat will pop up. Before Ken Bruen's Jack Taylor the only UK based private eye that managed to convince was Mark Timlin's Nick Sharman. 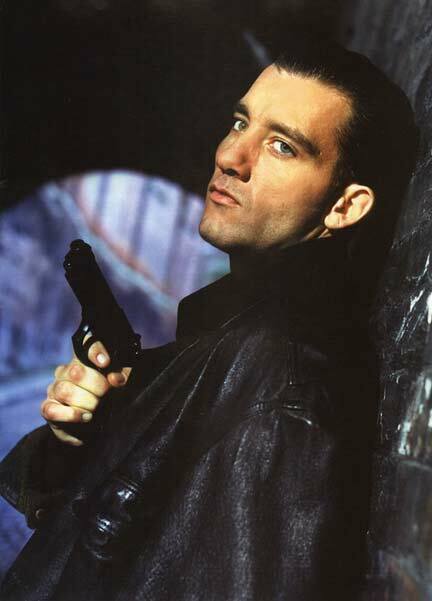 The character was brought to the screen in the excellent though short lived, Sharman TV series with Clive Owen in the title role. There were five of these TV movies made in total and all are worth seeking out. This collection contains eight short stories and the novella, Filth and all are full of the usual grit and downbeat realism that admirers of Timlin's work have come to expect. The driving narrative, usually first person and told with a street tongue powers along as the author takes us into London's seedier side. The fact that Sharman, disgraced ex-policeman and now private eye very much belongs among the seething criminal under class makes the Sharman stories all the more real. They belong to the hard-boiled school and the author presents a credible and often nasty depiction of life on the wrong side of the law. Chap O'keefe sends details of the second BHE paperback - Liberty and a Law Badge - "The book is written (as you know) and plans are well advanced for publication. The book is in PDF proof form, has an ISBN, and artist Michael Thomas is currently preparing its tailor-made cover illustration. 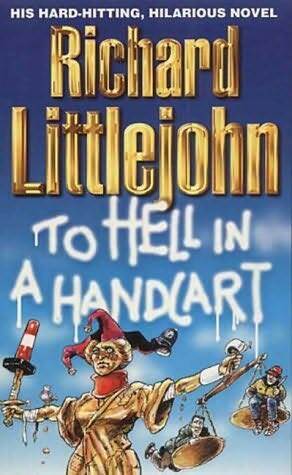 The intention is that the cover should carry over the much-applauded "series look" of Misfit Lil Cheats the Hangrope. I'll send the Archive an image as soon as it is completed." I am currently reading the story so expect a review here soon. "It involves a young boy who immigrates from the old country to the new country - to a New World - on a trail of adventure and fortune. He crosses the Mississippi, leaving civilization as he knew it, and experiences the Wild West. WB appears to always be positive, always charging the day, and he falls in love. Suddenly, he and his newfound love are separated by an ambush, and he is left wandering, wondering where she is. He moves forward in his life, always in search of Ginny. He goes to work in the gold mines and experiences hard times and the drama of life, like we all do as young teenagers. He grows and finds out that mining is not for him. 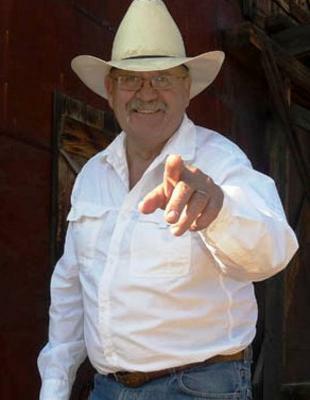 He comes back again looking for his lost love and experiences the Indians in the Wickenburg area. He comes back and experiences cowboying. He grows up, learns and matures." Arkansas Smith - Old West enigma. Arthur Conan Doyle’s most famous characters, “Sherlock Holmes” sends Holmes (Robert Downey Jr.) and his stalwart partner Watson (Jude Law) on their latest challenge. Revealing fighting skills as lethal as his legendary intellect, Holmes will battle as never before to bring down a new nemesis and unravel a deadly plot that could destroy the country. Once you’ve seen the movie, why not explore Sherlock’s Britain for yourself? VisitBritain has created a new website that gives loads of great itinerary ideas for the independent traveller and super Sherlock fan. The movie also stars Canadian talent, Rachel McAdams. I've got four days off from filming so it's time for the Archive to get down to some serious nonsense - unfortunately we've got bad news for book lovers everywhere. The Archive has been predicting this for some time but now it looks as if Borders decline is terminal. THE ARCHIVE SAYS: Although it is a harsh market place with times being hard, particularly for the book trade which is in a period of change, some blame must be with Borders themselves - the stores here in the UK just don't feel like bookshops and from personal experience the majority of staff don't know much about books at all. The service has been shoddy for a long time now. Still I do hope a miracle happens and that Borders survive - only a few years ago they were my favourite shop in the entire world. Another long day on set ahead - 10.30am - 11.00pm - we're very close to a wrap now so maybe I'll write something about the shoot this weekend. In the meantime please browse the wealth of material on The Archive. It’s a fact of life that any piece of technology you buy will soon be obsolete – be it a mobile phone, computer or just the humble TV in the corner of your room, while you’re unboxing it some guy in marketing is putting the finishing touches to an ad campaign heralding the arrival of its replacement. This is one of the more famous episodes - it introduces the Romulans and the concept of the Neutral Zone which would both become part of Trek-lore. I'm not that much of a Trekkie so I'm not qualified to say how many tweaks there have been to this remastered episode but it looks and sound awesome. The story opens with Kirk performing a wedding on board the Enterprise which is called short when an Earth outpost situated on the borders of the Neutral Zone is destroyed by an unknown enemy. Soon other outposts are attacked and then the Enterprise comes upon the Romulan warship. What follows is a tense battle of wills between the two ship captains which will only end when one destroys the other. Watching these shows now we are reminded what a ground breaking series Star Trek was - the episode deals with diplomacy, bigotry and ethics which were hardly concerns of most SF shows of the period. Star Trek changed the entire genre and from episodes like this it's easy to see why. 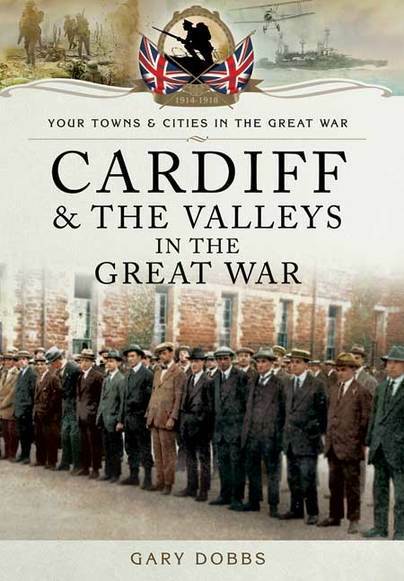 MY HOMETOWN OF Gilfach Goch was fictionalised for Richard L lewellyn's bestselling How Green was my Valley. This was filmed by John Ford and the script was also adapted for the Lux Radio Theatre. The entire production is embedded below starring the original cast. Man, I love those American/Welsh accents. Note the player actually contains 24 Lux movie adaptions and How Green was my Valley is no 13. Press play and then skip forward until you reach How Green was my Valley. In December 1900, The Denver Times ran an account of the celebrations in what would later become Colorado. The army, civilians and several Indians were at the open air feast, which culminated in a night of dancing and merrymaking. Apparently a good time was had by all ...well, with the possible exception of the half dozen turkeys that were consumed. According to the WIKI the first Thanksgiving feast lasted three days providing enough food for 53 pilgrims and 90 Indians. The traditional Thanksgiving menu often features turkey, stuffing, sweet potatoes and pumpkin pie. Americans may eat these foods on modern day Thanksgiving, but the first feast did not consist of these items. On the first feast turkey was any type of fowl that the pilgrims hunted. Pumpkin pie wasn't on the menu because there were no ovens for baking, but they did have boiled pumpkin. Cranberries weren't introduced at this time. Due to the diminishing supply of flour there was no bread of any kind. 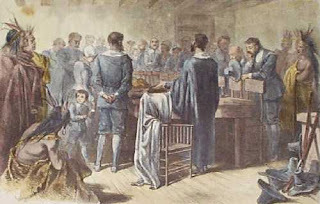 The foods included in the first feast included duck, geese, venison, fish, lobster, clams, swan, berries, dried fruit, pumpkin, squash, and many more vegetables. In the more remote corners of the Old West people wanting to celebrate Thanksgiving would have to improvise and hams, beef and chicken were often used in place of the traditional turkey. Some of t hese celebrations have been lost to history but thanks to diaries and letters we have written records of a few of these celebrations. In 1860 a Kansas housewife wrote to her sister in New York, informing her that they had a grand feast some unnamed critters instead of turkey but never was a tastier meal served. 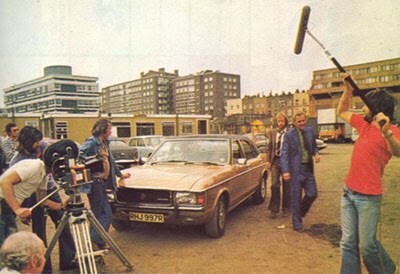 The Sweeney is in many people's opinion, mine included, the best television cop series ever made anywhere. Eat your heart out The Shield - no matter how good you are you just don't compare to The Sweeney. The show, made by Thames, was first aired on the independent networks in the UK in 1975. it was shot entirely on film, rare in TV in those days, and was an immediate ratings winner. John Thaw, these days better remembered for his cerebral portrayal of Inspector Morse, is Inspector Jack Regan and Dennis (Minder) Waterman plays his sergeant George Carter. This episode finds Jack undercover as a lorry driver while he tries to get to the top man in a lorry hijacking operation. It's all gritty 1970' s realism - the fashions look bizarre but the characters are as real as people on the street and the climax is genuinely exciting. This is quality television and still holds the viewer in a vice like grip today -the DVD box set is superb and stuffed with extras. The series is sometimes shown on television but these are heavily edited cuts to confirm with our politically correct times but the episodes on these discs are complete and as originally broadcast. Check out Danny Hogan's guest blog over at Paul D. Brazill's - everyone's hanging out there. Held over from the Sherlock Holmes weekend, The Archive shows you how to emulate Sherlock Holmes on a limited budget. A person can be whatever they want to be - that's the philosophy of the Tainted Archive. Reinvention of yourself is easy if you follow a few simple steps. From time to time The Archive will show you how to become someone else, or at least appear to do so. And so in this, the second of an irregular series, The Tainted Archive goes all self help and shows you how to become a man like Sherlock Holmes at the minimum cost. The first step towards Sherlockdom is the presentation - it goes without saying that you will need the pipe and although a deerstalker is preferable a derby or flat cap will suffice. A cape is an optional extra and can easily be adapted from a table cloth. Always prefix your close male friends names with "my dear" but not in a gay way; rather in an intellectually male way. And wives and girlfriends should be referred to as, "The Woman". Though to become a true Sherlock you must spurn all female company and embrace celibacy. You and your male companion can be affectionate but never go beyond the point of Victorian decency. Unless of course you are aiming for a post modern Holmes as Robert Downey then you are permitted to flirt and wrestle with your male companion. 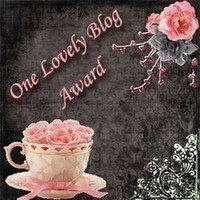 Indeed if the latter activities appeal then look out soon for our how to emulate Oscar Wilde lesson. You must also develop a specific speech pattern - pepper every statement with exclamations, as if it has suddenly occurred to you in a flash of genius. 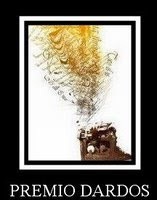 Pace your room a lot, hands clasped behind your back while trails of smoke bellow out from your pipe. Every now and then you will have to feign being in a drug induced stupor - this can be achieved by watching videos of Sarah Palin for two hours daily which will eventually allow you total disinterest in your surroundings. For the truly authentic Holmes you can purchase cocaine from one of those Emo's or as they like to be called emotional children. These Emo kids are easy to recognise - Hitler haircuts, drainpipe trousers and lacerated arms. Remember to mix your cocaine in a seven per cent solution. Why does Ian McEwan give away in advance what will happen in Atonement? What does Donna Tartt's The Secret History have in common with Daniel Daeoe's Moll Flanders? Why is Mark Haddon's The Curious Incident of the Dog in the Night-time printed in sans serif format? Blowed if I know ...Though you will after reading this guide by Mark Mullan, author of The Guardian's Elements of Fiction weekly column. And whilst most of the books studied here are of the literary bent the lessons learnt apply to fiction in general. And there are a number of pop-fiction books included for analysis-Ripley Under Ground and From Russia with Love to name but two. It makes for an interesting read - After all a novel is a collection of words arranged in a narrative that creates a world detached from reality and yet, when done well, this world holds us in a ultra reality, the characters become cherished friends, flesh and blood people of the id. We readers knows the story is fiction, an imaginative fabrication as we read and yet somehow we get sucked into the story and an emphatic bond is formed.A good work of fiction can enrich us and leave us more developed people than we were when we started the fiction. The book, unlike the weekly Guardian column which concentrated on specific books, split the chapters into subjects such as beginnings, the voice, the climax and looks at these aspects of several titles. It's not surprisingly a heavy read and I did think I had learned some interesting points from the book. The section on plot devices is especially illuminating. 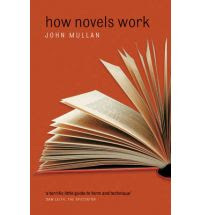 “I try to ask some of the essential questions about the art of fiction. "the author writes. " Is realism real? How do we define a successful metaphor? What is a character? When do we recognise a brilliant use of detail in fiction?”. 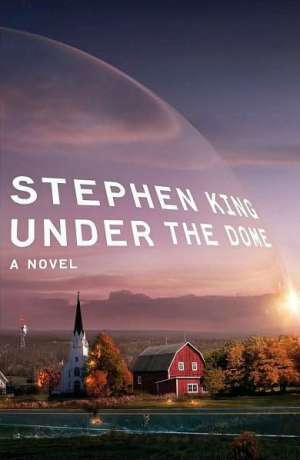 The problem with general discussions about fiction is that it is hard enough to write about the details of one novel, let alone to comprehend an entire mode. But Mullen does so and does so with gusto. The book has, I believe, only been published in the UK but can of course be got from Amazon and shipped around the world. One in five new apps in the Apple app store last month was an electronic book. There are now 10,000 ebooks for the Apple iPhone and iPod Touch, most of them free and many available for download as entire libraries. For example, Classics (£1.79) is a collection of 23 — you guessed it — classics, including Dracula and Pride and Prejudice. Browse a book from the shelf and the beautifully animated page-turns and crinkly paper sound effects are enough to win over even a diehard dead-tree bibliophile. Even so, as all its titles are out of copyright and therefore, in effect, free, it’s a bit of a cheek to charge so much. With the Great Books Mega Collection (£1.19) you get 200 for your money, with the option of setting it to roll an entire chapter past your eyes — good autocue practice for newsreaders. Free Books (an oxymoronic £1.19) includes those same 200 books plus a further 23,269. The volumes are not actually included in the app; instead it’s a searchable index on which you tap to download. This means you’ll need to be in a wi-fi zone or have a 3G signal to install a book. Why pay a thing? With the free Shakespeare app you get the Bard’s 37 plays, 154 sonnets and five poems along with a search function capable of picking out a phrase in seconds. Wattpad is another free app for Apple and Nokia devices, but classics are hard to find among thousands of self-published works — mostly misspelt and attempting to titillate. Less like browsing in a library; more like marking year 10’s English homework. To get hold of any new bestseller, you’ll need to shell out real cash. Most usable of the bookstore apps is the B&N eReader (free for Apples and BlackBerrys). You’ll need to open an online account (in US dollars) with the Barnes & Noble chain (prices are a little lower than in UK bookshops); the app then saves each download on the smartphone and puts a copy on your computer. After which, all that remains is to stoke the fire and throw on another hardback. Alan Ladd as Ric in Casablanca - yep, you read that correctly. The Lux Radio theatre started out producing hour long radio versions of popular Broadway hits, but when it started to produce it's own version of current hit movies it doubled its audience overnight. It strove to use the original stars for their audio recreations of the movies but many of the stars were reluctant to take the then arduous journey from Hollywood to New York or a one off radio show. 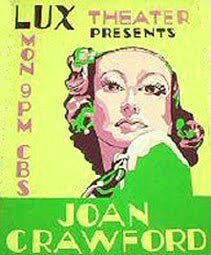 The result of this was that the Lux Radio show moved to Hollywood and many big stars worked with them - John Wayne, James Stewart, Humphrey Bogart, James Cagney and Gary Cooper to name only a few. When the original stars were not available the studio used equally big names which was how Alan Ladd took the Bogart role in the radio adaptation of Casablanca. Over the years I've picked up a few of these shows on CD but these days most of them can be heard online at the Internet archive. Here you will find versions of old movies including westerns (She Wore a Yellow Ribbon is especially good), crime thrillers (Angels with Dirt Faces is again excellent), melodrama, comedy and even historical epics. Most feature the original stars and once you start listening you simply can't stop. Several of the shows are embedded above but visit the site and you may even find an alternative version of your favourite movie. Many of leading names in stage and film appeared in the series, most in the roles they made famous on the screen, including Abbott and Costello, Jean Arthur, Lauren Bacall, Lucille Ball, Ethel Barrymore, John Barrymore, Lionel Barrymore, Ingrid Bergman, Humphrey Bogart, Charles Boyer, James Cagney, Claudette Colbert, Ronald Colman, Gary Cooper, Joseph Cotten, Joan Crawford, Bing Crosby, Bette Davis, Dan Duryea, Frances Farmer, Errol Flynn, Ava Gardner, Judy Garland, Greer Garson, Cary Grant, Lillian Gish, Charlton Heston, Bob Hope, Vivien Leigh, Fredric March,Agnes Moorehead, Paul Muni, Vincent Price, Donna Reed, Ginger Rogers, Mickey Rooney, Frank Sinatra, Ann Sothern, Barbara Stanwyck, James Stewart, Shirley Temple, Gene Tierney, Spencer Tracy, Lana Turner, John Wayne, Jane Wyman, Orson Welles, Loretta Young and Robert Young. I keep updating the Archive with the latest news concerning the eBo ok revolution - that's what the Archive is for and not only do I plan to cover genre fiction, films, but all elements of pop culture. And as a writer and reader the book industry is something that involves me. Digital books are the single most important thing happening in publishing at the moment and so I will continue to go one and on about the subject until something else of equal importance comes along. Don't hold your breath though - the last development of such paramount importance was the development of the printing press. The eBook world is seeing new developments by the second but the biggest concern at the moment is the format wars currently being fought. This can be confusing and leaves people understandably dubious about buying a reader that will be obsolete in a few short months. Thankfully a format seems to be starting to dominate and it's not the Kindle code. ePub seems a likely bet and I think I'm correct in saying all readers, including the Kindle, will be able to display PDF versions. My own reader, The Elonex, is far from the best reader on the market and it is basic in comparison to the Sony and Kindle but I download a lot of public domain books and then convert them to PDF files and I'm in my oils. Any book that ends up on Google Books will likely be able to be downloaded in a PDF format and if not the file can easily be converted. The Elonex can also handle the popular ePub format. However early adoption of the eReaders can be expensive and industry experts are predicting a big price drop in the near future. So maybe holding out that little bit longer but believe me if you are a book lover you'll eventually want an eReader. Will they ever do away with real books? That will never happen and eBooks should be able to compliment regular books rather than largely finish them off the way MP3's have with CD's. Books are a different matter and people have a genuine love for all that paper glued between two pieces of board. I'm proud of my library and will always keep adding to it. But I'm more and more inclined to buy the latest big sellers as eBooks these days. I'm eager to see my own books made available as eBooks and am waiting for the day when all books are available as eBooks and priced fairly; after all it's a lot cheaper to produce an electronic book. The natural progression of this will see people becoming bedroom publishers and putting their own work on the web, often free of charge. Indeed this is already happening and a great many of these will be crudely written and will vanish but the next megaseller could come about in this way. The rock band, Artic Monkeys hit the top spot without a record deal and built up a fan base on the web and it is not too far a leap to think a massive writer could be birthed in this way. No longer can it be denied that eBooks are the way the industry is going to go - Little, Brown has just released an eBook-only update of "The Vaccine Book: Making the Right Decision for Your Child"--an instantaneous publishing response to public concerns about H1N1 flu (or Swine Flu) vaccines. This instant publishing - the book is on the market instantly the book is ready to go. Topical books will become all the more topical. However I would like to make it clear that despite photographic evidence I myself have nothing to do with the initial outbreak of swine flue. 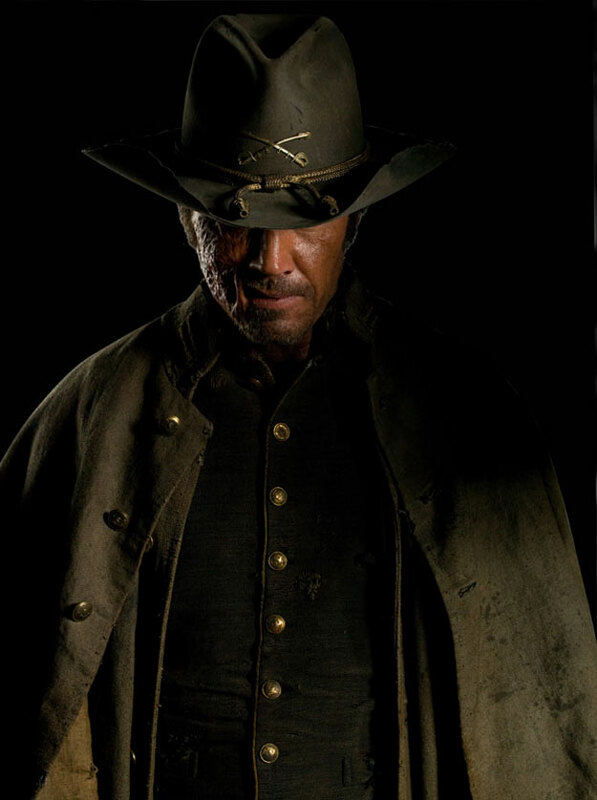 Arkansas Smith is an enigma, a mystery man of the West. There are some that say he is an outlaw, a vicious killers but others who claim his hand is guided by good. Not much is known of his early life but we do know from letters left by his adopted mother, that he was born in the midst of an Indian attack. Indeed this newborn child was the only survivor of the massacre. 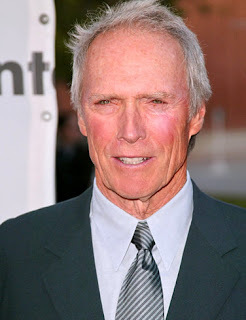 He may have been a Texas Ranger at one point and there is some evidence to support these claims but the only thing we know for sure he is that he lives a nomadic lifestyle and that trouble follows closely behind him. March 30 2010 sees the publication of Arkansas Smith by Jack Martin, the first in the chronicles of the legend known as Arkansas Smith. The size of the print run is largely dictated by pre-orders and my previous novel, The Tarnished Star sold out several times. 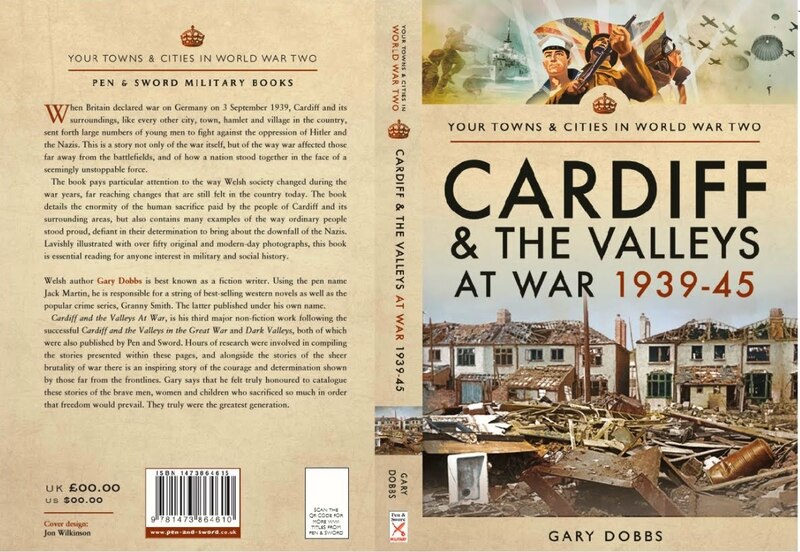 So why not pre-order now - no monies will be deducted from your bank until the book is ready to ship and you will be guaranteed your copy nice and early. To pre-order CLICK HERE or simply click on the image in the sidebar of this blog. This is the 26th title in the long running series centered around the ultimate antihero Edge. It sees our man in a Mexican town where he plans on a little peace and quiet and maybe even the chance to marry Isabella Montez if she'd have him. Yep, the old killing machine seems to be mellowing. However it is obvious that where Edge hangs out, trouble usually follows and it certainly does in this book. This is another great adult western where the action escalates towards the inevitable terrible violence at the climax. Now you are unlikely to find a bad Edge review on the Archive - I make no secret of my admiration for the books. Well apart from the Edge/Steele team ups which I don't think worked as well as the characters respective series. But to my mind the Edge series, written as entertainments and nothing more, have that magic storytelling dust sprinkled over every word that keeps the reader turning the pages and afterwards looking for more. 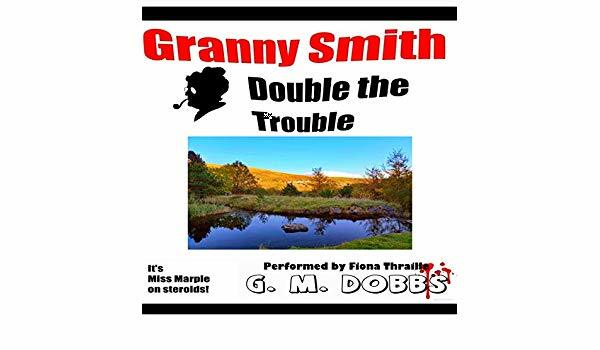 The pacing of the story is set at the usual breathless pace and the humour is as tight as ever and compliments rather than waters down the suspense and thrills. This book also features one of the corniest last lines in the entire series but it brings a slight half smile to the lips as you close the book. Edge won't be to everyone's tastes, there are some who think them too violent, but if you liked the spaghetti westerns of old, with all their blood,guts and black humour, then the Edge books will be for you. But if not-well, you don't know what you're missing. GOOGLE INC owner of the most popular Internet search engine, and a group of authors and publishers won preliminary approval of a revised settlement over the company’s plans to make millions of books available online. A U.S. District Judge, in a ruling filed yesterday in New York, granted preliminary approval of the settlement agreement and scheduled a hearing for final approval on Feb. 18. The authors and publishers revised an earlier settlement to limit the Internet company to books published in the U.S., the U.K., Australia and Canada. Several nations including France and Germany objected to the reach of the earlier deal, which would have covered millions of out-of-print books published around the world. Under the $125 million agreement, Google will set up a Book Rights Registry with publishers and authors to compensate copyright holders whose works are scanned. It also would seek to identify and compensate the rights holders of so-called orphan works whose owners aren’t currently known. Anyone who only knows that later, more successful seasons of the BBC's sitcom, would be puzzled viewing the firs t season for the first time. 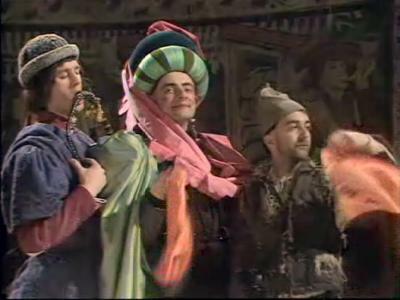 At this point the characters had not really been established and the biggest difference to the later seasons is that the roles of Edmund Blackadder and Baldrick are reversed - Edmund is the simpleton while Baldrick is the devious schemer. "I have a cunning plan, my lord." 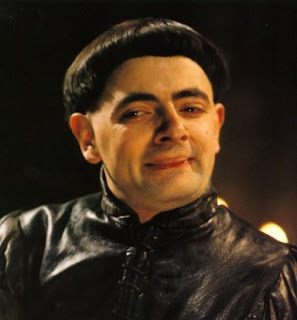 The first series is set during the Dark Ages and like all the other series it follows the misadventures of Edmund Blackadder. It is implied in each series that the Blackadder character is a distant descendant of the previous one and this time Edmund is the despised son of King Richard the fourth, yep you read that correctly,and each episode represent sublime and intelligent comedy set in a different historical period. The first episode, The Foretelling, opens with preparations for the battle of Bosworth fields - Edmund sle eps late for the battle and accidentally kills Richard III (Peter Cook) , who proceeds to haunt him for the rest of the episode. The second episode, Born to be King finds Edmund, believing his father to be dead, sees a chance to seize power by revealing that his brother is actually illegitimate and that he, in fact, should be the heir to the throne. The third episode, The Archbishop sees Edmund becoming the new Archbishop and realising his life is in danger.The Fourth episode, The Queen of Spain's Beard sees Edmund having to marry a Spanish Princess in order to cement a treaty between England and Spain. However he is horrified to find his bride resembles, in his own words, a dog. This is arguably the strongest episode in the first series with some great lines. The fifth episode find the infamous Witchsmeller accusing Edmund of being a Witch and th e first season concludes with Edmund gathering together the seven most evil men in the country to help overthrow his father. The series dealt comically with a number of medieval issues in Britain and it was originally written by Rowen Atkinson and Richard Curtis but it was not until the second season when Ben Elton joined the writing team that the series really took off. 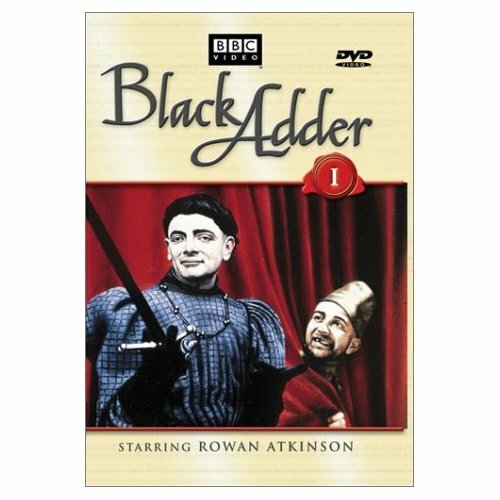 Initially a second season was not commissioned; Blackadder being shot on film was expensive by sitcom standard and the BBC had tucked it away on BBC2 where it attracted a minority audience. Over time though it has become to be regarded as a comic masterpiece, which it truly is. It plays around with historical fact and features top knotch performances from everyone concerned. I re -watched all six episodes of this first season in order to write this review and it is as good as ever - if anything the first season is improved with familiarity of the entire canon. It's interesting to see how the characters developed over time and to witness the seeds from which the comedy masterpiece, arguably the best British sitcom ever, sprung. The comic seeds were sown on incredibly fertile ground which would gain numerous awards and a fan base that remains loyal to this day. If you've never seen this series then you really need to remedy this. The best option is The Complete Blackadder boxset which contains all four series plus the various specials made over the years. Each series is also available as a single BBC DVD. Whilst browsing in W.H. Smith I overheard two women talking about the new Martina Cole book. O ne of the women had the tome in her hand and was about to go to the till, when her friend pointed out that she could get it for only £9.99 in Tesco. This resulted in the women returning the book to the shelves - Smith's lost a sale and Tesco, no doubt, gained one. I wonder which business needed the sale more? I myself am guilty of buying bargain books from Tescos and ASDA - the entire James Bond canon in a handsome box for £15, this years Beano annual for £7. And that's not to mention the box set of three Agatha Christie paperbacks for £5 and similar box sets of Bernard Cornwell, Alister Maclean and Jack Higgins. I use the word "guilty" because whilst it makes perfect financial sense to buy these bargain sets, it could be damaging the long term viability of the book industry. In the US Walmart are in a bitter price war with Borders and Amazon. It's all great for the book loving consumer but the rewards may be simply short term. The humble old book if facing an uncertain future as it is without it being devalued so. 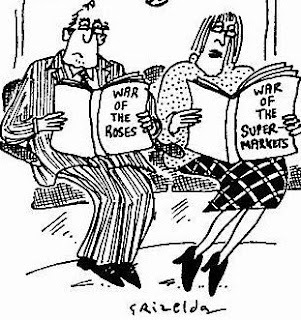 The latest news from the US is that the Justice Department are going to look into the book price war. Meanwhile here in the UK the bargains continue to tempt and not just online but in all the major supermarkets. Now cheap box sets of backlist books, that is titles where the publisher and author have already made their money, are fine and represent a better deal to the consumer. After all why should we be expected to pay top price for a paperback of a book first published decades ago? But the pricing of brand new books by big name authors to entice customers, some supermarkets even treat books as loss leaders, is damaging to the industry as a whole. It's already difficult enough for a new author to break through and the current trend could make it impossible. After all why take a chance on a new author when you can buy the latest Stephen King, Stephanie Meyer or John Grisham for a meagre sum? So what do we do? Boycott these cheap books? That's not going to happen and it would be a rare book lover who would happily pay top price for a book in order to safeguard the industry. It's perplexing sure enough -I'm all for bargains and I believe that anything of such an age, no matter how popular, should be much cheaper than the original price. But not if it means that in a few short years nothing other than the biggest names will be published. Alas what is the answer? Do we need the return of something like the NET book agreement? Or should the free market be allowed to run its course? Barnes & Noble embraces social digital rights management (DRM) and snubs Amazons proprietary AZW format. alvo in the escalating eBook wars, Barnes & Noble recently announced it was standardizing on the open ePub and PDF formats, embedded with “social” digital rights management (DRM) content protection. With this move, B&N is embracing the cross-platform Adobe solution accepted by nearly 100 providers, including Sony (announced in August it plans to convert its eBooks to the ePub format by the end of 2009). However, that group does not include market-leader Amazon, which debuted its popular Kindle 2 in early 2009. Kindle 2 eBooks are available in Amazon’s proprietary AZW format, as well as support for PDF, HTML, DOC, JPEG, GIF, PNG, BMP through conversion. This running battle between Amazon and everyone else is driving down prices, fueling better retail distribution and drawing massive media attention-all factors cited when Forrester Research revised its 2009 sales projections last month on eReaders by a stunning 50 percent. Forrester now expects that three million eReaders will be sold in 2009 (the previous projection was two million), with 30 percent alone bouncing off the shelves during the holiday season. What’s more, for 2010, Forrester projects even more dramatic growth of eReader sales, of up to 10 million units. The ePub move makes sense for B&N to grab market share from powerhouse Amazon. Producing books under one standard already adopted by other eReader device manufacturers is attractive to consumers. For one, consumers can transfer eBook collections across various devices, important for preserving their purchases should their manufacturer discontinue support. And, by adding password-based content protection for ePub, Adobe addresses piracy concerns, but delivers a less onerous DRM option. I must say I enjoyed this satirical novel that takes a sly dig at life in modern Brita in - a country full of righteous do-gooders, self serving politicians and politically correct morons. Mr Littlejohn envisions a defeated and beaten Britain. Insightful of him given that in the eight years since the book was published this has largely come about. No matter how outrageous the politicians in this book nothing in this fiction compares with the real life expenses scandal which continues to play out even today. Ex-cop, Mickey French is an ordinary bloke but when he is attacked in his own home and forced to defend himself he find himself arrested for murder. 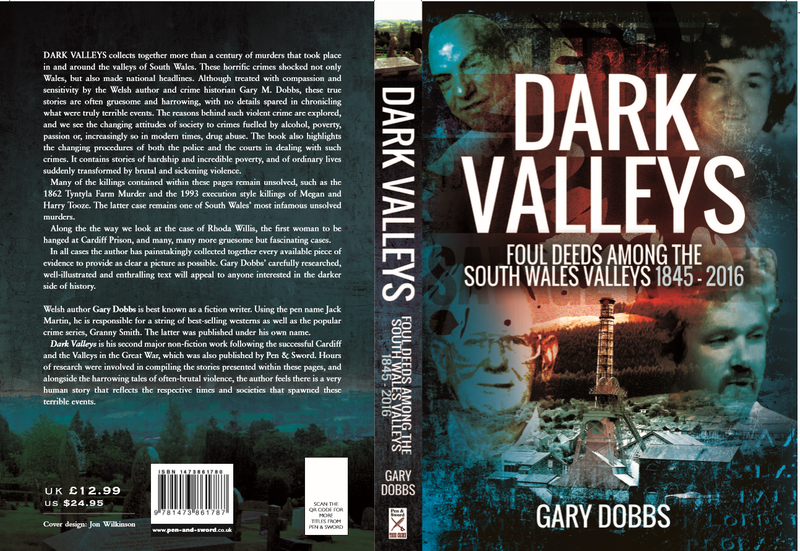 It all seems to be loosely based on the celebrated Tony Martin case and it hits home its point with vigour. Sure you'll laugh at the insanity of it all but you'll also feel despair and anger at what Nu-Labour have done to the UK. Don't read this book if you are a Guardian reading, Nu-Labour supporter as it is likely to offend you but anyone else is in for a good time at the expense of the politically correct brigade and the establishment itself. 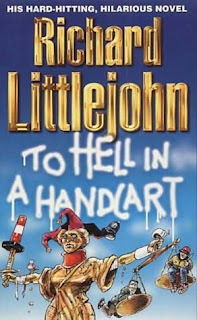 The book is no longer in print and Littlejohn - the author has had charges of bigotry aimed at him over some of the passages in this book but I think that misses the point. If there is a message the book is trying to convey then it's, live and let live and that tolerance is a two way street. But each day the newspapers are filled with ever more ridiculous stories about the PC brigade...At the end of the day Political Correctness is just another term for censorship but let's lighten up and enjoy the book for what it is - a satirical swipe at bland Britain. 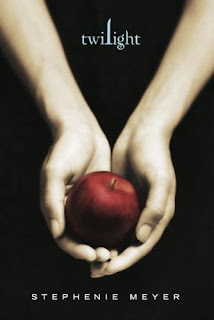 Gina Barreca, an author and English professor at the University of Connecticut, is a vehement critic: "The big thing that really makes 'Twilight' a really bad book is that fear should never be an aphrodisiac. The idea that you fear your lover should not make him sexier and that is a big part of these books. ... It distresses me to see that in any form, whether or not it's supernatural. "It's a damaging fantasy. ... It's the idea that she feels as if she is in a dangerous relationship and she doesn't know how to get out of it and that finally, however much in danger you feel, love has to conquer. ... No, when you feel yourself in danger, you have to go away, put yourself in another novel." Suzanna Narducci, a co-founder of TweenParent.com, a website for parents of 9- to 13-year-olds, said she wouldn't forbid kids from reading the books or seeing movies, though she admits that when Bella gives up Dartmouth, "that killed me," and the relationship between Sam and Emily "reeked of domestic violence." "It's a matter of using it as a teachable moment," said Narducci. "Romance means something so different for them. ... It's important for parents to use it as an opportunity to have an open dialogue about what romance is like" and about the difference between fantasy and reality. CLINT EASTWOOD's NELSO N MANDELA movie is facing some serious competition - JENNIFER HUDSON has signed on to a rival project about the former South African president's wife. The veteran actor-turned-director recently wrapped filming on Invictus, which will see Morgan Freeman tackle the role of the legendary politician , alongside Matt Damon. But the movie is facing a challenge from Oscar-winner Hudson, who has signed on to play Mandela's wife Winnie in a new movie but this time with the emphasis on Mrs. Mandela. This week we have our usual trawl of the Wild West Web as well as a question/answer session with newcomer to the Black Horse Range, Lee Walker AKA Ed Furguson. That's him over there on the left. But first our regular look around the web for western content - well it seems neat to start with Lee Walker's Westerns which is Ed's own blog. And of course the first stop in any western web trawl is the excellent Western Fiction Review, the site is updated several times a week and the current post is an interview with Keith Hetherington, a writer with years of experience in the western genre. In the mood for a some western fiction, well head over to Short Barrel Fiction, where there are stories for all tastes. Davy Crockett's Almanack is featuring some varied subjects of late but there's always something western going on. Meridian Bridge goes from strength to strength and has lately posted an interview with Mr. Bill Crider. I especially liked that one. And finally Nik Morton informs us on his blog of the latest news on the eagerly awaited anthology, A Fistful of Legends - it's getting exciting now. And this gives us another neat link into our Q+A session as Lee Walker also has a story in the forthcoming collection. How does it feel to be joining the Black Horse range? It’s great! I’m definitely the new kid on the range but I’ve found everyone involved with Black Horse Westerns to be very supportive and encouraging. I’m amazed at their level of enthusiasm for the genre and have found that everyone wants others to succeed. To be honest, I wasn’t expecting that. What does the Western mean to you? As a kid, I remember curling up on the sofa on a wet Sunday afternoon watching old black and white cowboy movies with my grandfather so I guess I’ve always had a soft spot for them. From a historical point of view, the more I read, the more I am amazed at the sheer bravery and determination of the men and women who pioneered the West, settled it and finally tamed it. I admire the breadth, quality and sheer creativeness of western writers and get annoyed when people get a little ‘snooty’ about the genre. Where do you see the western's future? 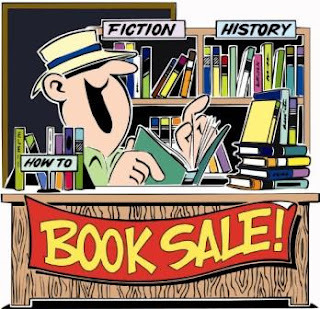 I think it’s healthy and as long the genre adapts to other means of distribution like Kindle, E-Books, POD etc I don’t see any reason why the stories will not continue to sell. When I speak to people about western books, they tell me you can’t get your hands on second hand books because they sell so well and people collect them. In libraries, borrowing frequency is still high (check out how many times the books are borrowed) so there is still a very healthy interest in them and I don’t see that going away. It is frustrating though, to go into large bookshops like Borders and Waterstones and not see a dedicated Western section! Hopefully, characters they can believe in and a good action-packed yarn. 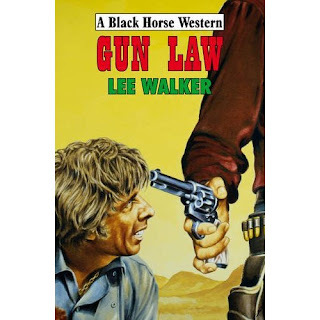 Gun Law was my first book and although I’m proud of it, already I can see ways I could have improved on it. I hope in subsequent books to keep growing and improving as a writer. I’ve got a few things in the pipeline. Gun Law comes out at the end of December so I’ll be busy working on the publicity for that. I recently sent John Hale the first three chapters and synopsis of Gold Fever, my second BHW and he responded favorably and has asked me to send him the completed manuscript, so I’m busy putting the finishing touches to that. I signed up for this years National Novel Writing Month (NaNoWriMo) which started on 1st November and I’m busy blitzing through a 50,000 word first draft of a novel with the working title, ‘The Man Who Wouldn’t Die’, which if I finish, will hopefully become my 3rd BHW. I reckon those projects will keep me busy until the end of the year! I’m already setting New Year goals for 2010 and have got outlines for another four books – nothing like setting your sights high, I say! Believe it or not, I’ve just discovered Louis L’Amour! (I told you I was new to westerns.) Thoroughly enjoying getting through his books and I’m a big fan of Matt Braun and Annie Proulx – and of course I try to get through as many BHW’s too! I like to come up with a title first and then I write out the plot using index cards breaking the story down into separate scenes the way a scriptwriter might. Once I’m happy with the arc of the story, I can then start to develop the characters and do any research I need. Of course, these parts all work together, so sometimes the character changes the plot, or another idea comes out of the research that changes the direction but I try to have it all worked out before I knuckle down to the writing. Never give up. Enjoy the journey. Don’t do it for the money. Seeing your name on a book makes it all worth it! I would take the complete collection of Time Life Western books which I am working my way through at the moment. Great photographs, very informative and great research for BHW’s – although they are so enjoyable to read, it doesn’t feel like work. A movie? I’d take Dances With Wolves. For fun - Eastwood V Wayne. Who wins? Has to be Eastwood but a big Wayne fan too. WAS THE RIPPER A BIRD? Do you take sugar with that book, sir?